The Ashland Plan features a large master bedroom and bath with a closet that has ample space for your entire wardrobe. 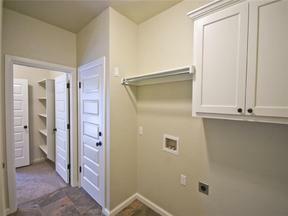 You’ll love the fact that you can access your master closet from the laundry room! The flex space off of the entry makes for the perfect office. Secondary bedrooms are on the opposite side of the home away from the master. You’ll love the open kitchen which overlooks the living room with a gas fireplace an dining area that opens to the back patio. Home has Delta Professional faucets and Whirlpool appliances. Alarm system and zoned sprinkler system included. HERS Energy Rated Home. Deer Creek Schools. The Grove has wonderful amenities!! 2 pools, 2 workout facilities, 2 clubhouses, walking trails and playgrounds. Come see this home!